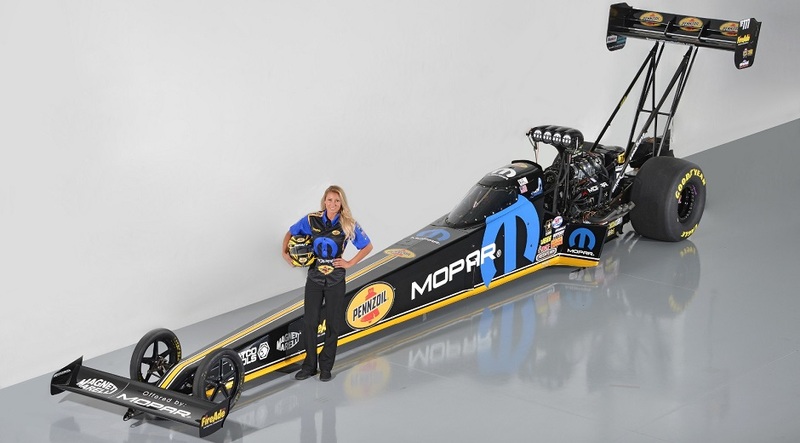 DENVER – Mopar and Pennzoil have announced a joint sponsorship of the NHRA Top Fuel dragster driven by Leah Pritchett in select NHRA Mello Yello Drag Racing Series events for the remainder of the year. Don Schumacher Racing driver Pritchett will debut the blue Omega M on her dragster at the 37th Annual Mopar Mile-High NHRA Nationals, scheduled for July 22-24 at Bandimere Speedway near Denver. Mopar and Pennzoil will also support Pritchett and DSR at Sonoma (Calif.) Raceway on July 29-31, followed by Sept. 30-Oct. 2 at Maple Grove Raceway in Reading, Pa., and at Las Vegas Motor Speedway Oct. 28-30. The announcement brings the Mopar brand back to winning roots first fueled by drag racing icon Don Garlits, who captured the majority of his Top Fuel championships and event wins under Mopar HEMI power. The new Top Fuel machine also expands the Mopar presence in the NHRA Mello Yello Drag Racing Series. The brand now serves as a sponsor in three of the four NHRA Pro classes (including Matt Hagan’s NHRA Funny Car and Pro Stock entries piloted by Erica Enders and Jeg Coughlin Jr.), and also remains deeply involved in supporting amateur NHRA Sportsman racers, introducing last year the next generation of its modern-day package car, the Mopar Dodge Challenger Drag Pak. The association with Pennzoil extends an already robust global business relationship between the two brands. Shell supplies bulk and packaged oil and transmission fluids for Mopar in the United States, Canada, Mexico and many additional countries throughout the world, and Pennzoil is the approved factory-fill for Chrysler, Dodge, Jeep and Ram vehicles. Pennzoil is also a major associate sponsor on Hagan’s Mopar Express Lane Dodge Charger R/T Funny Car. Pritchett, 28, captured her first career Top Fuel victory earlier this season and advanced to the semifinals at the recent Route 66 NHRA Nationals. Mopar will act as her primary sponsor for select events, including the NHRA Denver, Sonoma and Reading stops. “Shooting for the moon is what we do, and now to have two great global corporations like Mopar and Pennzoil get behind me is all I can ask, along with driving for Don Schumacher Racing, the most successful organization in drag racing,” said Pritchett, who claimed her very first NHRA Wally trophy at Bandimere Speedway as a nine-year-old Jr. Dragster racer. “This has been my goal for several years, and it means absolutely everything to me. I’m very proud to represent the Mopar brand in its return to Top Fuel.